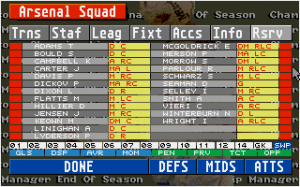 Bundesliga Live is a managerial simulation of the German Premier League ("Bundesliga") back in the nineteen-eighties, using real club and player names. 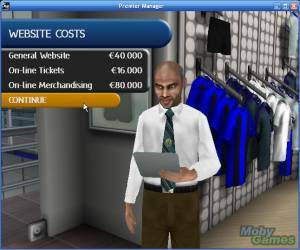 The game gives you control over the following management aspects: player transfers, advertisement contracts, taking loans (and paying them back). You can also change the team and player names. 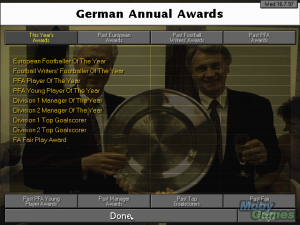 Before a match starts you have to nominate the players which should take part in it. 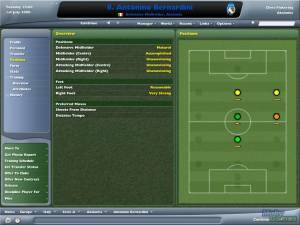 As additional options, and quite odd for a soccer manager, you may attempt to bribe the referee and / or choose to use doping on a maximum of two of your players. The attempt at bribery can be repeated as long as you have money left over. When using any of these special options you will receive penalties when the attempt fails (financial deduction and team performance hampered by drop in morale). Immediately after finishing your preparations and choosing to start the match, the result is calculated in a short sequence ("goal-counting"). This is accompanied by statistics about earnings and expenses related to the match day. Afterwards the results of the other matches are displayed, followed by the new ranking in the league table. Finally, the game will return you to the initial management menu.